After we got Dexter, we discovered that he has luxating patellas- trick knees- and we had surgery to fix that when he was a year old. 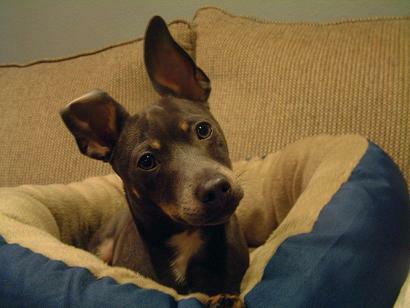 He also has a strange ear thing going on where his ears flop backwards. Not forwards, not straight up but backwards. I've never seen anything like it and neither has any vet we've visited. 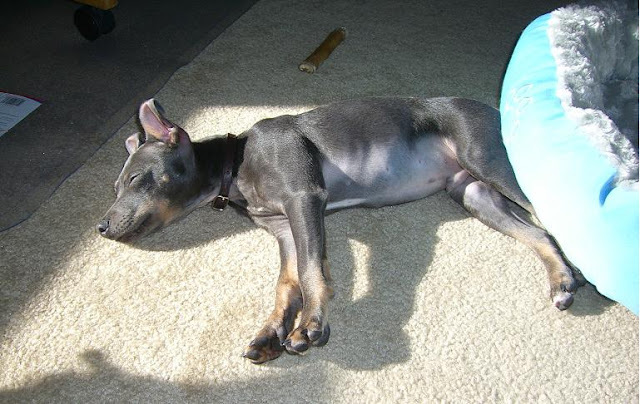 He also has an undiagnosed follicular dysplasia of some kind that is called Canine Pattern Baldness. 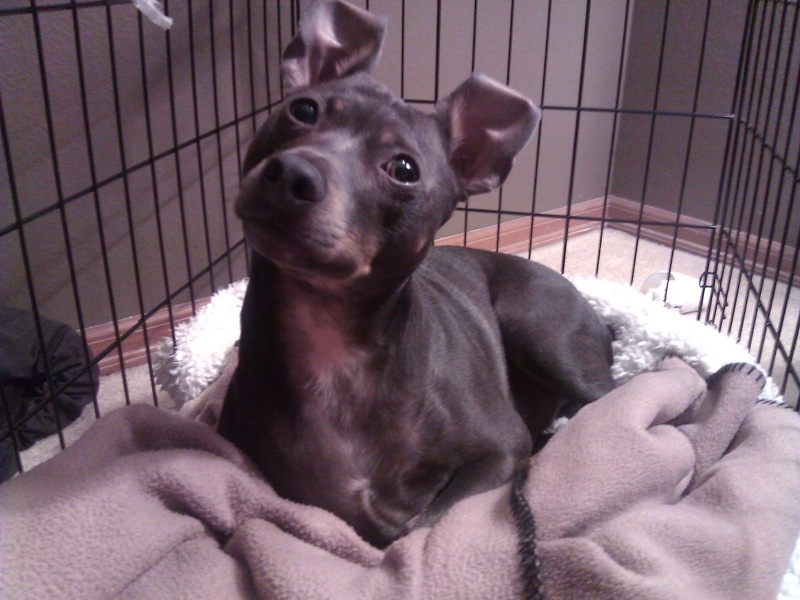 That's because he is a "blue" dog which are apparently prone to issues, at least among rat terriers. So he has a bald spot on top of his head, no hair on the back of his ears and very little hair on his underside. The rest of him has normal hair. We've always affectionately called him our "broken" dog or our "recessive" boy (blue is a recessive gene). We've joked that if anything were to go wrong with a dog, it would be Dexter that got it. He's just so... prone. He's been sick for a week now. His bloodwork is a mysterious conglomeration of super high nucleated red blood cells. His WBC is super low but band cells super high. But other things are totally normal. Nothing is adding up to any kind of diagnosis. His xray shows no blockage but he won't eat. He refuses to drink (we've done subcutaneous fluids 3 times now). He's on antibiotics just in case. He's lethargic, restless, shaking with pain. But he is eliminating just fine (well, when I can get him to eat). I just got new bloodwork done and the numbers have completely flip flopped. I'm at my wits end. We are now going in to get an ultrasound. We've been on a process-of-elimination journey with his symptoms and tests. The vet is now thinking inflammation of an organ in the gut, possibly, or internal bleeding because he has a lot of pain when his abdomen is palpitated. At this point, I don't think there's a good answer for anything. Before, I was thinking "I hope the antibiotics work." Then I thought "I hope fluids work." After that it became "I hope he has kidney stones" then "I hope it's just an obstruction." It's getting to the point where I'm now just hoping it can be fixed with surgery. My solutions are getting progressively worse and now it's becoming a horrifying mix of "If it's cancer, I hope it's benign" and "If it's a tumor, I hope they can cut it out." I am one nerve wracked, stressed out human. And that's why the blog has been a little quiet. Update: After I started writing this, the situation progressed pretty quickly. He went in for surgery today at 11am. The ultrasound showed so much inflammation in his organs that they thought it must be a foreign body. However, once they got in, they didn't find anything and there were no perforations. But, from his stomach to his bowel, everything was inflamed. He also had abdominal adhesions. My vet removed those and washed out his cavity and his organs. Everything is now clean, clean, clean! Causes? Who knows. Several biopsies were done and we are waiting for more info. Right now he's at an emergency clinic receiving monitoring and IV fluids, pain meds and antibiotics. It's ridiculously expensive but he's worth it. My sweet boy. So, he's doing well after all that and at least with all those pain meds, he's feeling better. Poor thing. I can't wait till he is back home and happy. He will have two weeks of convalescing in his crate with only short potty breaks. That's so hard but it's a lot better than watching him curled up in pain. There's things I would have done differently if I'd known better. I would have got xrays earlier, scheduled the ultrasound sooner, etc. Maybe I could have saved him some days of pain. It's a little hard not to beat myself up a little because I waited longer than I should have thinking it would resolve itself. All the girls at the vet clinic love Dexter. He is a ladies' man, that is for sure. He's just so precious and loving even when he's sick. When we came in after his surgery to pick him up and take him to the emergency vet for monitoring, they all came out to say goodbye to him. I told them he is a person, he has so much personality and they all agreed. At the emergency clinic, when they asked me what breed he was, I said "People. He's basically people. He's mama's little man." I love Dexter. He got very sick and experienced horrendous pain. He had surgery today. They found abdominal adhesions which were removed. His innards were extremly inflamed and he is being treated to fix that. Hopefully. Dexter is people. I love him to bits. He has been through the wringer! I feel like he deserves to catch a break! I just talked to the vet and he is recovering well with no complications. You know just how it feels. It doesn't matter *how* sick a pet is, that feeling of helplessness is just as stong. I hope Percy is back to his normal self and stays healthy furever! We've talked about him back and forth and I have wondered what he looks like. He's so cute, so sleek. You know how worried I am for all of you, your family, as you've said. Prayers for Dexter's fast and complete recovery and healing, and to go from a dog with mysterious illnesses to one that can build a healthy immune system now. Sometimes, dogs get extremely sick, and during the course of treatment for their current illness, they are given medication that happens to heal things that were " broken" for a long time. Maybe not ear form, but all the immune things he's had. Sarah, if you decide to start a GoFundMe or anything, please post it here. I'm not on social media, this is as " out there" as I get, but I want to help him and you and your hubby if you need it. So many times, we've faced extraordinary illnesses and specialty vet surgeries with extreme worry over our darling pet and also the financials. I mean, really, who has insurance on their pets? I'm not even sure it's available any longer.... The important thing is for him to get well and go home with you. I hope they discharge him tomorrow, or Monday. Hugs to all of your little family from me and my little family. He was discharged today and while he is pretty out of it on his pain meds, he's so happy to be home in his crate. I've been feeding him beef baby food and cottage cheese. Still no confirmed word on what possibly caused it. Everyone seems baffled and even the ER vets had never seen it before. We are luckily able to take care of Dexter without hardship plus we have a wonderful vet who gave us good recommendations. Dexter was living like a king while he was recovering! They apparently were hand feeding him because he wouldn't eat off a plate or out of a bowl. That dog! He gets everyone wrapped around his little paw. Especially me. I'm impressed that you are feeding him cottage cheese. We know how beneficial cottage cheese is to a healing dog's tummy. :) It also tends to keep them calm and so forth, lessening post- op pain. If I had a dollar for every carton of cottage cheese I've fed, sometimes piece by piece, we could get our boys on solid footing and head to Cabo. I know you feel overwhelmed and tired, but he's better and he should recover much faster than most people his adjusted age would. He's in very good hands. He's gonna be all right, even without a clear cut diagnosis of his initial illness leading up to the surgery. If only they could TELL us what they want/ need/ feel! Aww, thank you, Lauren! Since getting Dexter I've realized that having a dog is one of the most wonderful things ever. I like knowing I'm not the only one that considers my dog an integral part of my life. I don't know what I would do without him and even briefly thinking about it terrified me! He seems happily on the mend now and hopefully this never happens again. Thanks SO much for your well wishes! Aw I'm so sorry that you are going through this! As a fellow pet owner I totally understand that Dexter is your baby and you want to do the best for him. Please don't beat yourself up thinking you should have done things differently, you did the best you could! It's always easier to look back and say "I should have done this," but it's clear you were acting with Dexter's best interest in your mind at all times. I'm sending lots of love to you and Dexter, I hope that he gets well very soon! Thank you so much for commenting! I so appreciate your kind words. I read them as I was waiting for Dexter to be released from surgery to the ER monitoring site and they were a comfort. He is home with a bunch of stitches and a staple (aaah!!! ), resting on his pain medications. This was probably the scariest thing that's ever happened to me (and it wasn't even me in pain!). The fear that comes along with not knowing what's wrong or how to help is overwhelming. Now that he's safely through surgery and back home, I feel a lot better. We did the right thing, even if it may have taken us an extra three days to figure it out. I am so sorry to hear about this situation that you and Dexter have to endure. Happy to hear the surgery went well, and he is back home and recovering. Dexter is lucky to have such a good dog mom. Blessings! Awww Sarah Im so sorry your little dude is going through all that, it's heartbreaking when animals are sick and can't tell us what's wrong, but it sounds like you guys are really responsive and doing all that he needs right now. Here's hoping little Dexters recovery is amazing and that he has no further issues with this. He's doing SO much better! I'm so relieved! And all his tests came back fine, no cancer or anything scary. You *do* know how I feel! It's nice to hear it, too! He is doing so much better now. Yesterday was the first day he acted more like himself and he finally wanted to eat. Now it's comfy cone time since he wants to lick his incision and he HATES that. I just came by to ask how he was doing, and I am very happy to hear the news. Wanting to eat again is such a great thing! He is on the mend. :) Do they still have no idea what might have caused the severe inflammation? All his biopsies came back and I heard from the vet today. Everything was reacting normally to the inflammation but none of it was *causing* any of it. They're thinking it was possibly a foreign body so small that it wasn't noticed when they were washing everything or that jiggling his intestines got something moving (or that's how I understood what they were saying). But no actual evidence of what the cause was. Hopefully, it never happens again. With all your experience, do you have a suggestion for keeping Dexter from scratching at his incision? He has his cone so he can't lick but he's started trying to scratch. Do you think a belly band would work for that? Or would it catch on his stitches (he has 15 right down the middle of his abdomen)? Maybe a gauze wrap? Oh Dexter, you poor little man! I'm so sorry you folks are going through this rough time :( The more we care about something the crazier it makes us when things go awry, huh. But I'm glad the surgery went well and things are looking better. I hope Bugsy is handling it okay and taking care of the poor guy like a nice brother should! How is the little dog doing now, I hope he is recovered from the ordeal!